I have a sound blaster Z card and logitech Z906 surround sound 5.1 speakers. I'm using a optical cable connected to the base box to the card. Do I connect to the optical in or optical out of the sound blaster Z? 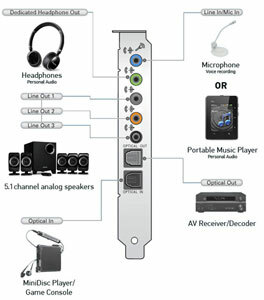 The soundblaster gets audio to the speakers, so it has to be connected to the optical out of the sound blaster. The optical in port is only if you wanna get audio into your PC, like an external playback device, e.g. game console. Help with Sound Blaster Katana! Solved! Rear Channels and Front Central coming out of the subwoofer? Solved! Do I really need a amp/dac for Sennheiser HD 58X? How to connect Active Speakers and Actice Subwoofer to the PC? Can I connect by Bluetooth to my Creative Sound Blaster Audigy FX 5.1 PCIe Sound Card ? how to connect the razer tiamat 7.1 to creative sound blaster z PCIe sound card? Audio Receiver died, connect Active Sub + 2 Speakers to Sound Blaster ZxR?